Chapter crafts: True gentleman card stampin UP! Hello and welcome back to Chapter Crafts. 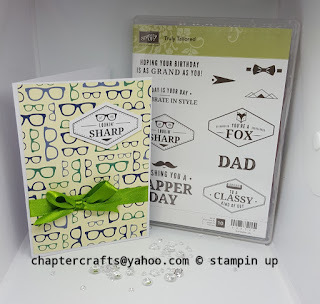 Today I have made a very simple card using the stamp set Truly tailored bundle from stampin up! This is one of those stamp sets that is great for men of all ages, and if you get the stamp and the punch attached the same time you get 10% off. Stamp your image on a whisper white card using basic black, then punch it out using the punch. Finish off with a strip of ribbon across the bottom and a bow.